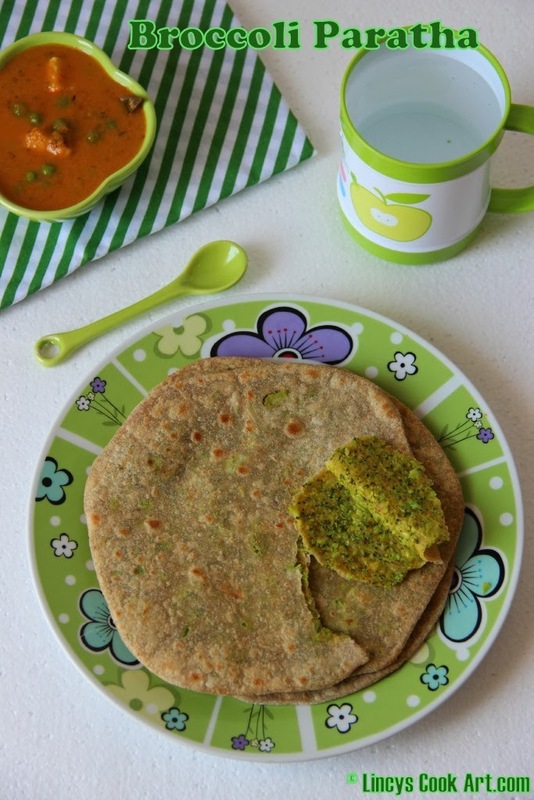 Broccoli parathas are a healthy version of stuffed parathas. The broccoli stuffing in these parathas tastes really nice and healthy. Easy to make tasty healthy parathas in minutes. Kids would also love this dish. My 3 year old loved this paratha. In a bowl add the Wheat flour, oil, salt and add enough water to make it as a dough . Transfer the dough into the flat surface knead to make it as a smooth dough for about 3 minutes. Divide the dough in to lemon sized balls. Keep it aside till you make the stuffing. Remove florets from the broccoli head and keep inside the blender with green chilli; grind as a coarse powder. Heat a teaspoon of oil in a pan and add cumin seeds/ ajwain. Once you get the smell of the ajwain, add the broccoli, turmeric, garam masala and salt. Saute in the oil till the raw taste of broccoli leaves in about 2-3 minutes. Switch off the gas; keep the mixture to cool and by that time make ready the parathas. Take each balls and spread slightly to stuff the balls. Now keep a tablespoon or a tablespoon and half sized stuffing inside all spread parathas. Gather the parathas edges together, press and seal the edges. Dust the surface with flour and roll the parathas. Heat the pan and add 3-4 drops of oil ; place the parathas and allow to cook on both sides by flipping and cook both sides till the air pocket's colour turn into dark golden to light brown colour. Remove from pan and serve hot any Subzi/ Curry/ Raita. wow! healthy parathas. Love to have it with some pickle. wow such an healthy and delicious paratha :) Makes me hungry dear , perfectly done !! lovely .. inviting it looks..
so healthy & yummy parathas...loved the last click. The reasons might be,1) U might have added more stuffing which the dough would not be able to accommodate 2) the stuffing might be too wet/moist 3)U might have applied more pressure while spreading.4) might not flour the surface while spreading 5) Initially do not spread a lot. Spread little as shown in the picture then keep stuffing close press the edges well. flour the surface and then spread the paratha. Make sure your stuffing is not wet.